8. NOT THE FLOWERS, PLEASE! I have this special friend "Ivan Maccinis" that really studies the game and makes it very personal and special. I decided to tell you what he thinks a good neighbor should do, when visiting. Read below. The MOST IMPORTANT thing for you to do on your visit is CLICK ON THE ROYAL BUILDINGS that you are on staff on. CLICK THEM! "I have quite a few kingdoms that I visit where I am the top clicker on several of their royal buildings and I'm able to make a lot of coins each time I visit them because of it. This builds up quickly and allows me to have the coins for expansions. The next area I'm expanding into is the one next to the witch's tower and the cost is 28 crystals and 564,000 coins so you need all the coin you can get in this game. 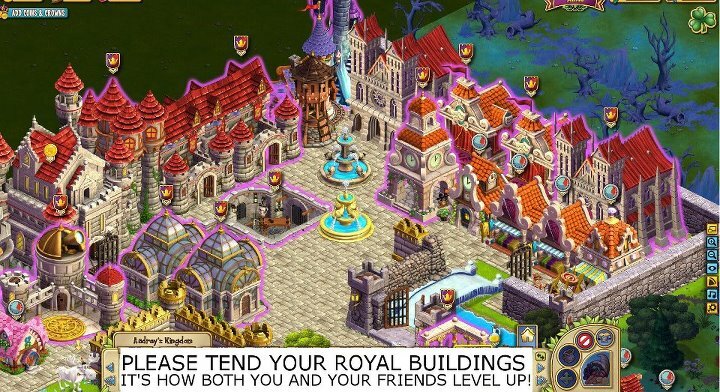 This will be possible for me from being the top clicker on many royal buildings: Obsevatory - 1,000 Cathededral - 800, Opera House and Conservatory - 650, Wizard's Keep and Clock Tower- 525, Dungeon and Royal Spa- 400, Witch Castle and Library - 350, Throne Room - 200, Royal Inn and Vault-175, Barracks - 150 and Maiden's Tower and Guard Tower - 125." - Their castle level goes up and they will return the favor to you. Let's say that you need to chop trees, instead of chopping 5 times on one tree, chop 5 trees one time each. The same goes for rocks and other things that will be consumed by your clicks. Always be sure to respect the keep off signs (red circle with a slash through it) they are there for a reason! The third most important thing for you to do when visiting is click on workshops and kitchens that have long term projects on the go. Again, this will be returned to you by your neighbour reciprocating when they visit you. WORKSHOPS: Work benches, Horse shoes, Anvils and Brick ovens. STUDIOS: Catapult, Ornate tapestry, Stained glass, Fasteners, Leggings, Tunics, Flags Leather pants, Bedding, Cloth apron and Cogs. KITCHEN: Carrot cake, Meat sandwich, Chocolate strawberries, Cake, Sausage and Fried fish. "I got just one click on a 24 hour project right after I started it and it took 5 hours off of it!" You will get more coins from this than from other actions and your neighbour still gets the coins so you're saving them energy and making coins for yourself by clicking these for them. The fifth most important is to click to accelerate things like the Jewelry shop, Butcher, Bakery, Clock maker and Tailor or maybe the Beastie laboratory. Since there is no way for you to know what your neighbours inventory level is it very well may be that the wheat you're harvesting or eggs you're collecting will go to waste because they will be over the limit. This is especially true in the busier kingdoms. The exceptions to this are any animals that haven't reached adult stage and any withered crops because it costs your neighbour energy to remove them so if you want to be nice, unwither them for them. Don't forget the water, you neead a lot of it so try to fish in every pond. ALL FLOWER SNIFFERS WILL BE SHOT ON SIGHT !! It's absolutely the most useless thing you can do on your vist so unless it's mission related DON'T DO IT! People who water crops will only be shot with rock salt at my place because it's not quite as useless as flower sniffing. Anyone who has their cropping area set up correctly is already getting a 50% speed boost anyway and having 5 plots ready for harvest sooner than the rest is not much help at all. Don't you need honey and beeswax? I don't actually mind if people tend flowers... I like your list, but other than killing the beasties I have off in a corner I say let them do what they want and don't get so uptight about it. "Shot on sight" I realize is a joke, but it shows you are taking this too seriously. Chill and let people play... if that means flowers so be it. "Welcome to my place! WELCOME TO MY PLACE AND O IT ALL, EXCEPT MY BEASTIES. If you need for a quest, just tell me and then I will be prepared to replace my beast. PLEASE DO: Royal Buildings, long periods crafting, animals (cows and chickens) and wither crops. My crafting buildings until 2 hrs, you can click but for me is equal if you do them or not.". So flowers is ok for me also, as well as roots and things like that. To be fair, one should also pay attention to "what good players do to WELCOME neighbors". Lots of quests require a player to do stuff at their neighbors' kingdoms, and it's kind of frustrating if the quest requirements can't be found, like there are no gloom creatures to beat up, no rocks to harvest, or no pond to fish out of, etc. - spare rocks and trees (and some saplings) - and replaces them when consumed - as well as mushrooms and/or roots and flowers, at least 5 of each. - animals for neighbors to feed, but you rarely see a kingdom without animals anyway. - gloom creatures (called with potions to places that don't inconvenience yourself) for neighbors to whack. - a few withered crops when possible. You could even set aside an area for a beautified rock & tree garden for your neighbors. Don't stress yourself out over this, but, like the neighbor etiquette, it's just a nice thing to do.